When you launch the program for the first time, you will be prompted to create the program database. The database contains all the information you enter in a single file. To make the information safe, it is strongly encrypted with a single password provided by you. You can quickly create the database with Database Wizard assistance. 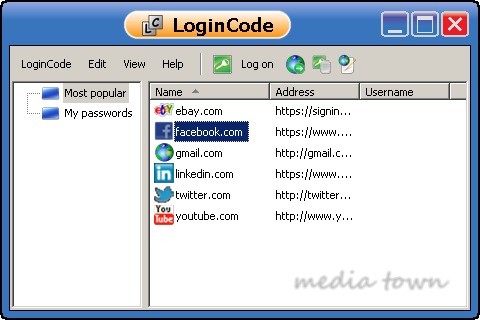 When it is created, LoginCode is ready to use (see the image below). Web Login Items stored in database contain the information needed to log on to a particular website. This information include site address, username and password. After you create the item, just double-click it to log on. Your username and password will be automatically entered into the browser. Note that even when you define many web login items, you have still everything under control. You don't have to remember tons of your passwords. You can add, modify or delete unwanted items. You can safely copy the database file to other computers used by you. You will never lose your passwords because of the browser failure, system reinstallation etc. LoginCode uses the world's strongest encryption algorithms to load and save the database. By default, SHA-512 is used for hashing the password and AES-256 is used for data encryption. These algorithms may change however in future releases of Windows since it is possible that new algorithms will be discovered and implemented in operating system. To work properly, algorithms used by LoginCode need a password from you. It's a very critical to database safety that you provide a complex and strong password. The more complex password is used, the better database protection is applied. On the other hand, password must be easy for you to remeber since there is no other way to access the information stored in database.